Makeup is an art to highlight your best features and mask the ones which are not that great. However make up looks good on healthy skin which is not starving of the much needed moisture . A healthy skin comes as a result of genes, healthy diet and a good skin care regime. However due to busy life and lack of time, we tend to skip certain important steps of skincare which leads to skin problems like pigmentation, uneven skin tone, wrinkles, blemishes and dry and patchy skin. After settling in Australia, my life also became really busy that I started to take my Skincare routine lightly and as a result of that my skin also stared to show dry patches, unevenness and fine lines which are early signs of ageing. However, I was lucky enough to notice these changes quite early and started to hunt for an affordable yet effective anti-ageing cream which I could use regularly to improve the appearance of my skin. After looking for a couple of creams at various stores in Melbourne, I finally bought 'Garnier Ultra Lift - 2 in 1 Anti Ageing Cream+Serum'. It was quite attractive to look at because of its swirl design and was quite affordable also so I thought of giving it a try. Packaging : Garnier Ultra Lift Anti-Ageing Serum+Cream comes in the form of a swirl contained in a clear plastic bottle which has a pump dispenser. The bottle has a very secure clear transparent cap which shuts tightly with a click sound and is very secure. Packaging is very eye-catching and sturdy and is extremely travel friendly. 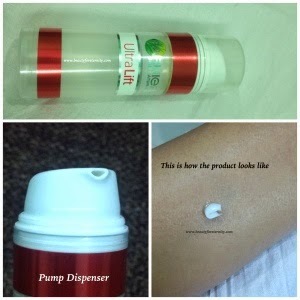 The pump dispenser is very convenient to use and delivers the required amount of product without any wastage and stays clean. The clear and tightly fitted cap ensures that no air gets into the opening of the dispenser so that not even a single drop of product gets dried out and clogs the opening. The product is in the form of a swirl and is lovely to look at. The clear bottle makes it easy to track how much product you are left with and can decide when you have to repurchase it. Product Description: 'Garnier Ultra Lift - 2 in 1 Anti Ageing Cream+Serum' is a 2-in-1 product that delivers the benefits of serum and moisturising cream in just one step. It contains pro-retinol which has been proven to improve the appearance of ageing skin. 'Garnier Ultra Lift - 2 in 1 Anti Ageing Cream+Serum' is a white coloured, cream sort of a liquid product with a gel like consistency. The formula is extremely light weight and the product just melts into my skin within a few seconds. It neither leaves my skin sticky nor leaves any white cast. It glides on my skin so smoothly and disappears when I gently massage it in. It is fully absorbed by the skin because of its light weight formula and makes my skin feel hydrated and smoothened over instantly. I have combination skin with an oily T-zone and it works well for me. Initially I had thought that it might make me look oily but it didn't. I rather felt it to be controlling oil secretion. I use it on daily basis after bath and before hitting the bed. It shows instant improvement in skin by making it soft and moisturised and after a few weeks of continuous usage the fine lines definitely faded away and a glow could be easily noticed on my skin. Due to it's light weight formula, I use it like an everyday moisturiser also. It's been nearly an year since I have been using it now. It worked perfectly in summers as well as winter season. I still have some product left which will last me for at least a month because I need only a drop size amount of it for my entire face and another drop for my neck. I have used it under makeup also and have had no issues so far. It works really well under all sorts of foundations and makes the blending process of foundation quite easy. The best part about 'Garnier Ultra Lift - 2 in 1 Anti Ageing Cream+Serum' is that it contains the goodness of both serum as well as moisturiser so you get double job done in just single step. It's an ideal product for working women and the ones who can't take care of their skin due to lack of time. I love it because being a mommy, I can still manage to look after my skin without taking much time. 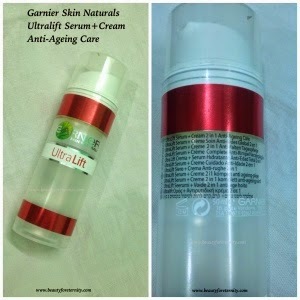 Coming down to the anti-ageing claims made about the 'Garnier Ultra Lift - 2 in 1 Anti Ageing Cream+Serum', I would say that it does help to some extent in fading fine lines but I doubt it's capability to handle wrinkles. I am 26+ and don't have any wrinkles so I can't comment on its efficacy for people who have wrinkles. However it's definitely effective in preventing the wrinkles and can delay the signs of ageing from appearing on your face. 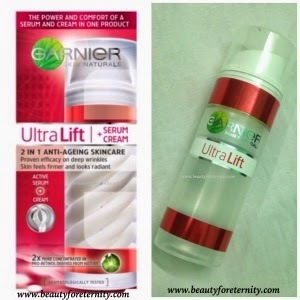 The only thing regrading the application of 'Garnier Ultra Lift - 2 in 1 Anti Ageing Cream+Serum' which I did not like was that my eyes sometimes became little watery and felt a stinging sensation when I used this product around my eyes. Fragrance: It has a nice fragrance which feels somewhat like herbal and lingers around for quite sometime before it fades away completely. I like its fragrance. 1. Makes my eyes slightly watery sometimes. Definitely go for it if you want to prevent signs of ageing like wrinkles, fine lines, uneven skin-tone, dry and rough patches etc. for a longer time. It does help to make the skin better to a noticeable extent and is very light to be used on a daily basis and underneath makeup. For this price, it's a steal. I will definitely buy this again and again.